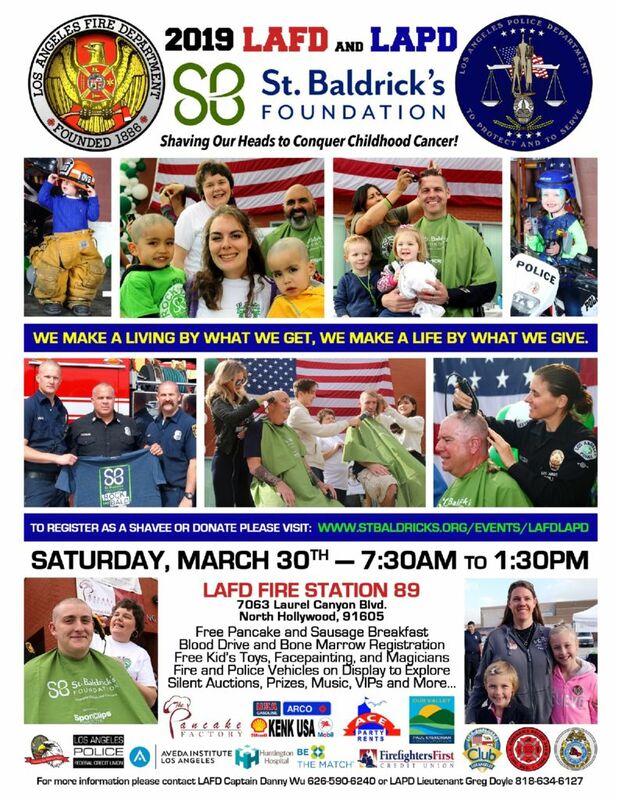 On Saturday, March 30th at Fire Station 89 in North Hollywood, your Los Angeles firefighters and police officers will join brave souls from the public and shave their heads in solidarity in order to support children who have lost their hair as a consequence of cancer treatment. Worldwide over 160,000 children are diagnosed with cancer every year, and sadly it takes the lives of more children in the United States than any other illness. By raising money for shaving their heads, shavees assist the St. Baldrick’s Foundation with offering research grants for finding a cure. This is extremely important because behind the U.S. government the St. Baldrick’s Foundation is the largest source of funding for childhood cancer research. – Free Pancake and Sausage Breakfast by the Pancake Factory North Hollywood! – Blood Drive and Bone Marrow Registration! – Refreshments by KENK USA, Coffee Bean, etc.! – Free Facepainting and Magic Castle Magician performances! – Fire and Police Apparatus displays and merchandise!